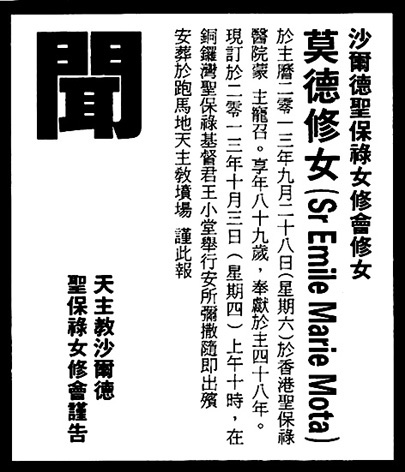 Sister Emile Marie Mota died peacefully at St. Paul’s Hospital, Causeway bay, on Saturday, 28 September 2013, at the age of 89 after 48 years in religious life. Sister Mota was born in 1924 in Shanghai and came to Hong Kong as one of the thousands who fled mainland China during the Cultural Revolution. It was while teaching at St. Paul’s Convent School, Primary Section, that her previous desire to dedicate her life to God was re-awakened. Because she was already in her 30s, considered over-aged at the time, she did not dare not apply to enter the convent at first. However, in 1960, Mother Marie Bernard de Broqueville became provincial superior of the Sisters of St. Paul de Chartres. Young, liberal and understanding, she received Sister Mota and another late vocation in 1962 when she was already 28-years-old. From the time of her first profession in 1965, Sister Mota faithfully served as a teacher and principal until 1985. Except for two years at St. Paul’s Convent School, Primary Section, She was principal of St. Paul’s Primary Catholic School in Happy Valley form 1969 to 1985. Sister Mota will be remembered for her fidelity to her commitment as a religious and, in particular, to the congregation’s spirit of regularity. As a superior of the community at Happy Valley and the school principal, she loved her sisters as well as the children entrusted to her care and was a good example of devotion and fidelity to her duties and obligations. A Mass of the resurrection was celebrated on 3 October, at Christ the King Chapel, Causeway Bay, followed by a funeral service at St. Michael’s Cemetery, Happy Valley.